What’s for dinner on Meatless Monday? I had always wanted to try to create my own black bean burgers—but, couldn’t find one recipe that I felt would build the perfect, black bean burger. Many failed to hold together during cooking while others never seemed to offer the right spice mixture. My solution? I combined my favorite veggie burrito toppings and seasonings to create a black bean veggie burger that was a family dinnertime, Meatless Monday hit. Prepare the black bean burgers. Mash black beans until they become almost paste-like. I like to leave a few bits of bean intact, so I opt to mash the beans by hand rather than in a food processor. I also find that processing the fresh veggies makes them watery--making it harder to form the burgers without dulling the flavor with bread crumbs. Add the chopped peppers, onions, carrots, celery, hot sauce and spices to the bean paste. Mix with a fork to completely combine. Add the egg and again mix well to combine. Mix in the bread crumbs by hand. Add ½ c. of the bread crumbs first, and add the additional crumbs until the mixture holds together and can be formed easily into patties. Shape the black bean burgers and chill. Divide the black bean mixture into 4 large patties. Place on a waxed paper covered plate and chill the black bean burgers in the refrigerator for at least one hour before cooking. Cook the black bean veggie burgers. Preheat the butter and oil in a grill pan over medium heat until hot. Add the chilled burgers and fry on each side until browned and slightly crispy. These may also be prepared without oil/butter by spraying cooking spray onto the grill pan and carefully browning burgers on both sides. Top each cooked burger with 1-2 Tbsp. shredded cheddar cheese and allow the cheese to melt. Build the black bean burgers and enjoy. I like to spread mayonnaise onto a toasted bun top and load these black bean burgers with lettuce, tomato, onions, black olives, and banana peppers. I serve these with sweet potato fries and fruit salad or my favorite cole slaw recipe. There are recipes that are just oh-so good. Yum! 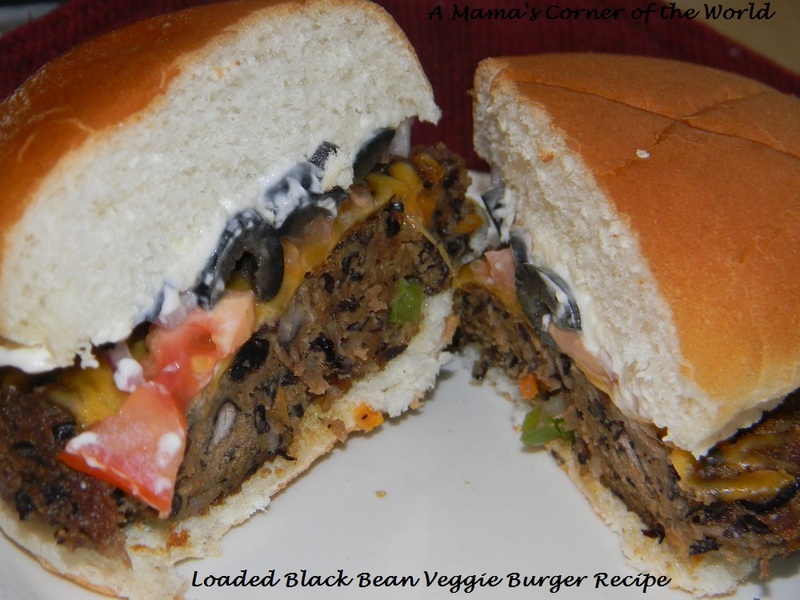 This black bean burger looks great! This sounds and looks great! Thanks for linking up to Sweet and Savoury Sundays, stop by and link up again this weekend!